FLATSHIFTER MAX, ELECTRIC SOLENOID GEAR SELECTOR SYSTEM. RACE ONE OR CHASE ONE !! WHAT DOES THIS KIT DO SIMPLY PUT ??? Put simply it changes up & down the gears for you, controlled by buttons mounted on your steering wheel or handlebars or using a set of paddles ( cars only) clutch use is still required, see “Motorcycle news” magazine road test below. The Flatshifter Max Electric gear selector system is manufactured and designed in the UK to offer the professional or club driver/rider all of the benefits of high tech paddle or button operated gearshifts for motorsport, leisure & disabled motorcycle riders at very affordable prices. This pro-shift system is compatible with virtually every vehicle with a sequential gearbox and will work perfectly with all of the Flatshifter range of quick-shifter products including our unique clutchless up and down gear quick-shifter systems. The Max electric pro-shifter system system is incredibly reliable having been tried, tested, & constantly developed for well over 10 years, with over 6000 kits supplied, being fitted to everything from motorcycles to race and rally cars drag racing & off-road racers etc with higher power options also available for Quaife, Elite, Hewland, Sadev, etc. etc. sequential dog box’s. please go to paddles page for full details of our gear shift paddle option. To add clutchless up and down gear shifting to this system please read about the Flatshifter Expert systems. MAX ELECTRIC GEAR SHIFT SYSTEM. HOW FAST CAN A MAX SYSTEM SHIFT GEAR ??? The Flatshifter Max electric shifter system will complete a downshift in about 50 Milliseconds there is a delay of 10 milli secs after the paddle has been operated then about 35-40 milli secs to complete the shift it can be got down to about 35 Milli secs TOTAL if it is a really good installation. Push button gear selector for effortless up and down gearshifts. Replicates a Drivers or riders gearshift. 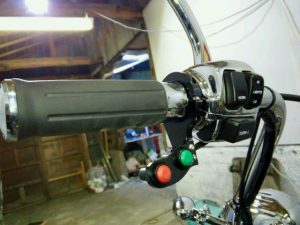 Handlebar mounted remote gear change buttons. Paddles available for race & kit cars. Swop to your next machine universal kit NOT model specific. Works on almost every sequential gearbox from motorbikes to rally and race cars. Universal kit fits virtually all makes & models of motorcycle engines. Fast gear shifting typically 35-50 ms on Japanese gearbox’s. We can supply heavy duty/ higher power units if required For Hewland, Sadev, Quaife, Elite etc type sequential transmissions.. The Flatshifter Max electronic gear shifter is dual acting for both up & downshifts and is very fast and consistent. Suitable for virtually any kind of riding or driving, whether you are looking for a fast change for racing or track days, comfort and convenience when cruising, or whether you have a disability preventing you from changing gear easily. The Flatshifter Max is the ideal solution For everyone. The Flatshifter electric shifter is a fully electronic gearshift system which should be best described as an ‘electric limb’ which can be operated by two discreet buttons or (optional extra) gearshift paddles. In the case of motorcycles and trikes, the buttons are usually mounted on the left handlebar conveniently beneath the thumb; when fitted to cars the buttons or paddles are mounted on the steering wheel. The system is powered by the car or motorcycles electric system and uses a powerful specially designed electrical solenoid that replaces`s the hand or foot actions when gear selection is required. Unlike compressed air shifters, there is virtually no maintenance, once fitted also no bulky inconvenient air bottles to fill or to inconveniently run out. The Max system is dual acting for both up & down gear shifts, and is very fast and consistent – typically 35 – 50 milliseconds on Japanese gearboxes but also works on almost any sequential gearbox from motorbikes to rally and race cars using elite Sadev Hewland Quaife etc transmissions. Suitable for virtually any kind of riding or driving, whether you are looking for a fast change for racing or track days, comfort and convenience when cruising, or whether you have a disability preventing you from changing gear with your hand or foot – the Flatshifter electric gear shifter kit is the ideal solution for everyone. Over the past few years we have seen a massive increase in bike-engined road and race cars, again it is perfect for this application, giving you a true F1 type feel, using either steering wheel buttons or optional paddles for a truly slick gear change. When combined with the Flatshifter Pro, Expert OR Blip quick shifters (clutchless up & down gearshifts!) this provides a lightning fast, fully automatic gear changing system operated at the push of a button. Experience a noticeable decrease in lap time and driver confidence left foot brake instead of depressing the clutch. Dyno readout available. The Flatshifter Max system works on any motorcycle type engine ranging from 90cc right up to 2400 cc. This universal system works on bike engined cars, ATV`basically anything fitted with a motorcycle engine of any age or make, and is used also for many on non-motorcycle engined racing applications. It is designed and manufactured in the UK using the best materials and comes with a full parts and labour 12 months warranty. What’s good? Simply, that I’m able to ride a bike after a long time off. In March 2009 I crashed while racing at Brands Hatch and suffered several injuries, one of which has left me unable to move my left foot. For some time I thought I would never be able to ride a bike again and with bikes having been a large part of my life for 35 years that really wasn’t something I wanted to consider. 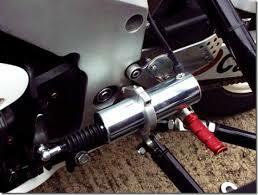 After looking at the various options I chose to fit a Kliktronic electric gear changer to my Ducati Monster 695. It is basically an electrical actuator that’s mounted to the frame with a purpose-built bracket and connects to the gear lever. When I press buttons on the left handlebar the actuator moves the gear lever either up or down to change gears. .After a brief tutorial, and with much apprehension, I set off for a quick lap of the industrial estate. It was simple to use and after my initial nerves had settled I was soon beaming… I was back on a bike, after four years. What’s not to like? There’s nothing negative about it. As far as our thoughts on the Max shifter: The Flat Shifter Max is a great solution for our car, it enables us to shift rapidly and reliably in competition. It has proved much more effective than any previous shifters we’ve tried. We have used the Flatshifter Max for a couple of year with zero problems. Of course we also won the Run offs with it the first time we used it. Will it fit my Car / bike / Gearbox application. 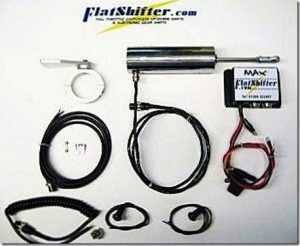 NOTE: THE FLATSHIFTER MAX IS A UNIVERSAL KIT DESIGNED TO WORK ON VIRTUALLY ANY MOTORCYCLE ENGINE, BIKE POWERED CARS OR OTHER RACE / COMPETITION VEHICLES USING A SEQUENTIAL GEARBOX, REMO SO GET THE MOST FROM YOUR INVESTMENT REMOVE FROM YOUR CURRENT MACHINE AND REFIT TO YOUR LATEST RIDE.NO NEED TO PURCHASE ANOTHER SYSTEM. UK & EU CUSTOMERS PRICES £599.00 + VAT & postage ( VAT EU CUSTOMERS ONLY).